Microchip Information : Shake A Paw Rescue and Adoption Center : The Shake A Paw Rescue and Adoption Center is a Registered New Jersey Charitable, Non-Profit organization created to provide animal rescue, shelter and adoption services. The Shake A Paw Rescue and Adoption Center is unlike any other Adoption facility. Located inside our state of the art Shake A Paw store and licensed as an Animal Shelter (Yes, we are a Shelter!! ), we accept dog surrenders from the general public, as well as rescue homeless, abandoned and unwanted dogs. 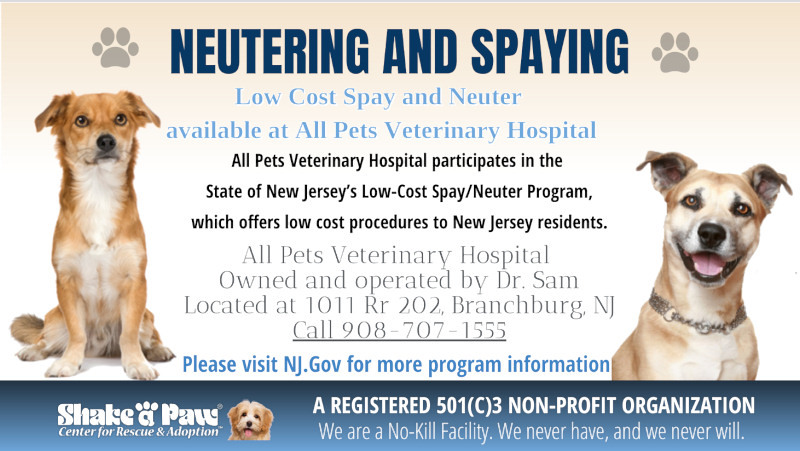 We are a Registered New Jersey Charitable, 501c3 Non-Profit Organization providing animal rescue, shelter and adoption services. Need to Surrender your Dog? Every Shake A Paw Rescue and Adoption dog will come with a microchip already implanted. Pet microchips are very small, roughly the size of a grain of rice and are implanted just beneath your pet's skin between their shoulder blades. Implanting the microchip is quick and safe similar to a routine shot. A pet microchip uses a radio frequency known as RFID to transmit the ID number stored on the microchip to the scanning device that reads the pet's unique number and displays it. Pet Microchips are not a GPS Tracking Device. Pet Microchips do not require a power source so there are never any batteries to replace or charge. Since there are no moving parts or mechanics, a microchip will last your pet's entire lifetime. It is important to register this unique microchip number with your contact information so that you can be reached immediately 24 hours a day if your pet is lost or found. Why do I have to register my pet's microchip? Once implanted, your dogs microchip is merely just a device that contains a unique number. For your personal security and your pet's protection, your emergency contact information must be linked to that unique Microchip. It is important to register this unique microchip number with your contact information so that you can be reached immediately 24 hours a day if your pet is lost or found. When a missing pet is found, the shelter, vet or other recovering organization will scan the pet with a specialized pet microchip scanner to determine if a microchip is present. If the scanner detects the presence of a microchip, it will display only the unique microchip number on the read out. If that unique identifier is registered in a participating database the facilty scanning your lost pet will be able to determine that the pet is registered to a pet owner and call to inform you that your pet has been found. Please click here to register your microchip today! !